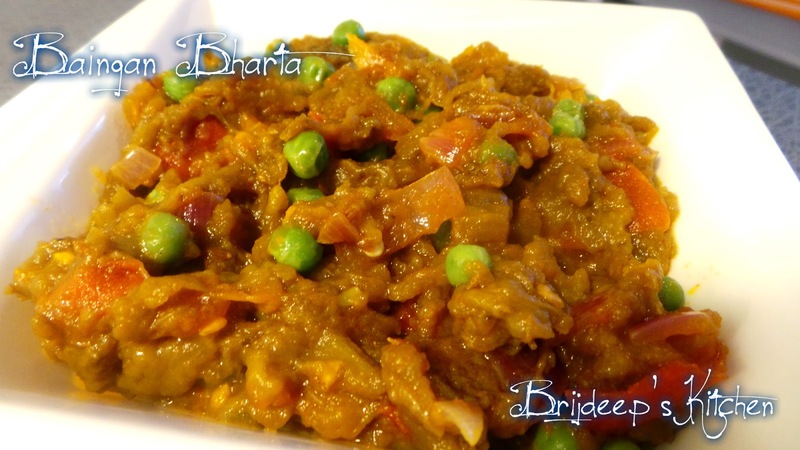 Baingan Bharta is a very special dish, not because this recipe contains some special ingredient, but it has a little story which means a lot to me. 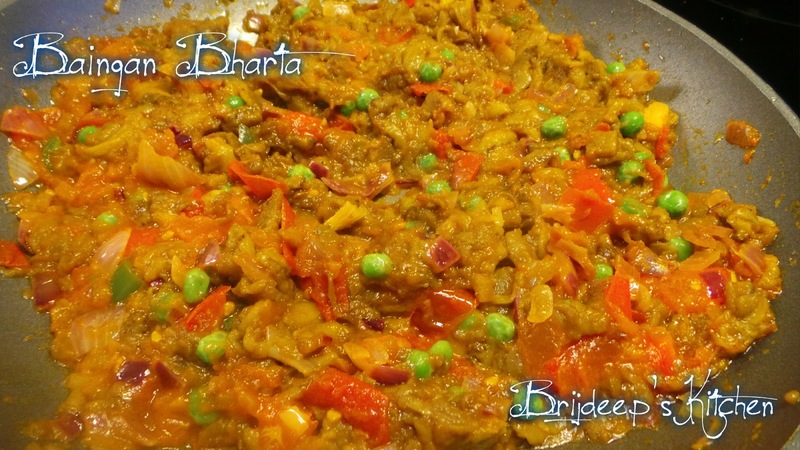 Baingan ka bharta is a very common dish in Punjabi households. I grew up enjoying the dish with hot chappatis and raita for a complete meal, at least once a week. When I got married, I came to know this is the favorite dish of my husband. But unfortunately we don't have the burner cooking range with flame here like we have in India on which the eggplant is wonderfully roasted, cooled and mashed and cooked into a delicious dish; and that was the reason I could never cook his favorite dish. I always used to feel sad that he can enjoy his favorite dish just once in an year when we visit India. He was lately craving for bharta and this summer we got the idea for bar-be-cue and bought a mini grill, and planned to grill the eggplants and prepare baingan bharta. We could never find the time and opportunity to use the grill, but one fine day I got this thought of giving it a try in the oven. So I put the eggplants in the oven and called my dad with crossed fingers for the recipe. He is an awesome cook and he makes some of the most wonderful dishes. 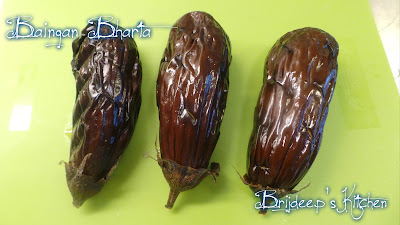 I wrote this very simple recipe and gave it a try with the oven-roasted eggplants. I tried to prepare bharta in the oven many times, and finally I nailed it in the fourth attempt and my hubby was extremely delighted. This dish has become his absolute favorite since then and now I'm always seeing 2-3 eggplants in our grocery cart during our weekly grocery shopping. So here is the simple, homely and lovely recipe of baingan bharta which I have been making a lot lately. The first step is to roast the eggplants in the oven. Wash and pat dry the eggplants and poke holes on all the sides using a knife. Oil the outer layer of the eggplants from all the sides. Keep on the oven grill and let them broil for about 40-45 minutes on 150 C. Remove from the oven and let cool a bit. Then put in a big bowl filled with cold water. Remove the outer skin of the eggplants and cut off the top. Mash the eggplants nicely with hands and keep aside. Heat oil in a pan and crackle the cumin seeds. Add the onions and fry until they are transparent. Add the chopped tomatoes and green chilli and sprinkle salt. 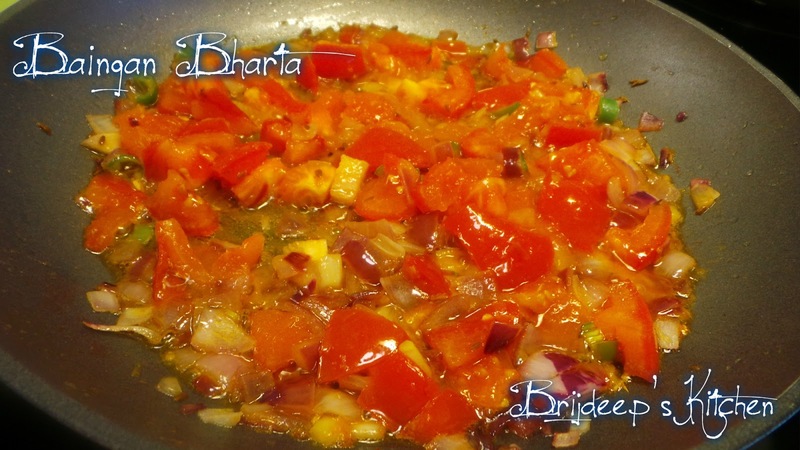 Let cook until the tomatoes are completely soft and mushy. Add red chilli powder and the mashed eggplant. Mix well and add the peas. Mix everything well and let cook on medium flame for about 10 minutes. Ready !! Serve hot with chappatis or parathas and raita for a complete light, quick and homely lunch/dinner. Loved this recipe? Don't forget to join me on my Facebook Page for regular recipe updates. 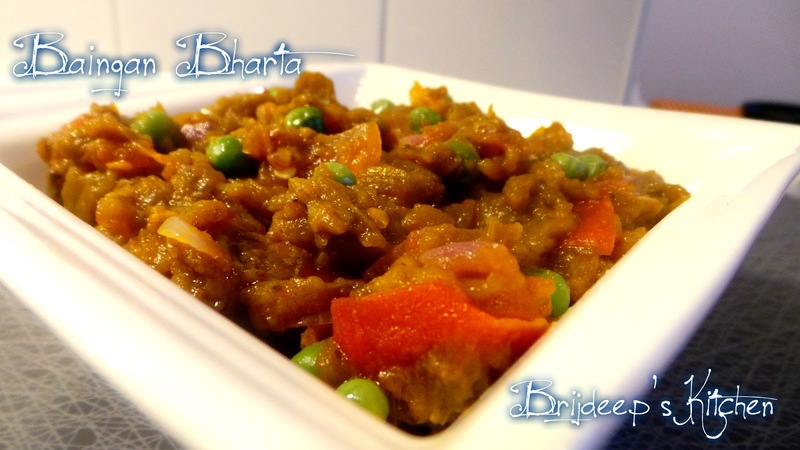 Looking for more Punjabi recipes? You might like Paneer Makhani, Aaloo Methi Subzi and Bhindi Masala. 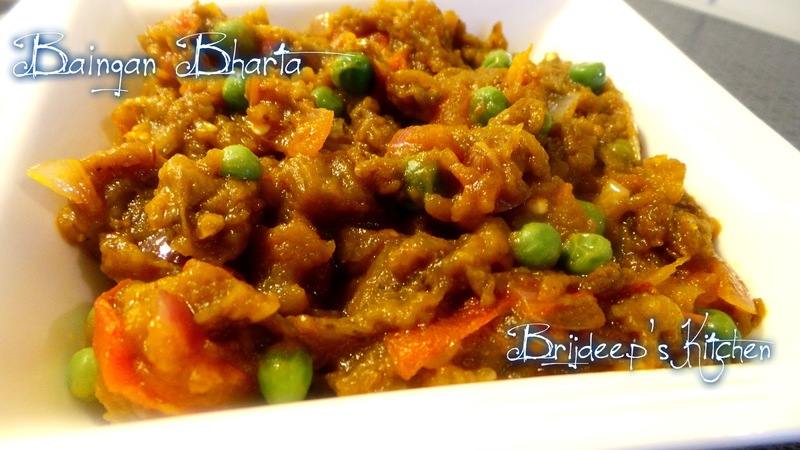 Wow, I love baingan ka bharta, It's so simple, and we can eat during lunch or dinner. Let share the ingredients with you which I have seen on site Living Foodz.